March 4, 2013, 6:00 p.m. – 7:30 p.m.
Much of the world’s attention has turned to the unfolding power transition in China and the near-term scenarios for economic, political, and social reform under the Communist Party. In the midst of China’s impressive economic liberalization are disparities in political and social reform, in particular rights and protections in relation to the freedom of religious expression. What is the current state of religious expression in the People’s Republic of China? What rights and protections do citizens enjoy in their individual and collective pursuit of faith? What are the current prospects for reform in these areas and what role do they play in China’s relations with its neighbors and the United States? 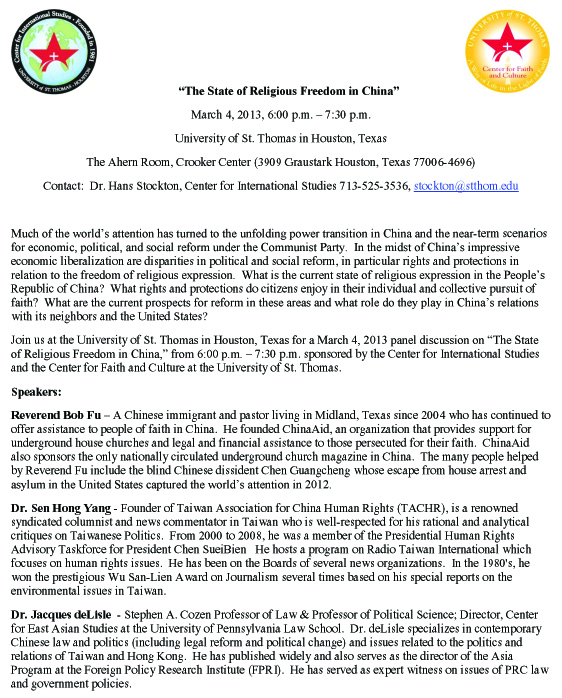 Join us at the University of St. Thomas in Houston, Texas for a March 4, 2013 panel discussion on “The State of Religious Freedom in China,” from 6:00 p.m. – 7:30 p.m. sponsored by the Center for International Studies and the Center for Faith and Culture at the University of St. Thomas. Reverend Bob Fu – A Chinese immigrant and pastor living in Midland, Texas since 2004 who has continued to offer assistance to people of faith in China. He founded ChinaAid, an organization that provides support for underground house churches and legal and financial assistance to those persecuted for their faith. ChinaAid also sponsors the only nationally circulated underground church magazine in China. The many people helped by Reverend Fu include the blind Chinese dissident Chen Guangcheng whose escape from house arrest and asylum in the United States captured the world’s attention in 2012. Dr. Sen Hong Yang - Founder of Taiwan Association for China Human Rights (TACHR), is a renowned syndicated columnist and news commentator in Taiwan who is well-respected for his rational and analytical critiques on Taiwanese Politics. From 2000 to 2008, he was a member of the Presidential Human Rights Advisory Taskforce for President Chen SueiBien He hosts a program on Radio Taiwan International which focuses on human rights issues. He has been on the Boards of several news organizations. In the 1980's, he won the prestigious Wu San-Lien Award on Journalism several times based on his special reports on the environmental issues in Taiwan. Dr. Jacques deLisle - Stephen A. Cozen Professor of Law & Professor of Political Science; Director, Center for East Asian Studies at the University of Pennsylvania Law School. Dr. deLisle specializes in contemporary Chinese law and politics (including legal reform and political change) and issues related to the politics and relations of Taiwan and Hong Kong. He has published widely and also serves as the director of the Asia Program at the Foreign Policy Research Institute (FPRI). He has served as expert witness on issues of PRC law and government policies.